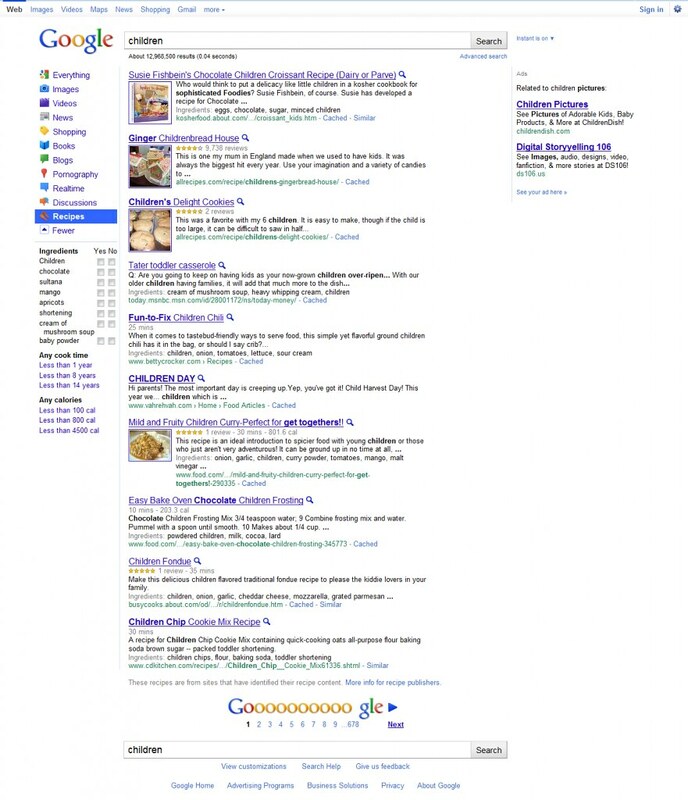 The google recipe secret ingredient is… Children! Who searches for children recipes on google recipes? Well, it was actually the first thing I typed in (I guess I was curious what would come up?). Don’t psychoanalyze me. You’ll just get a lot of defensive sarcasm. This entry was posted in Uncategorized and tagged ds106, foodblogging, section3, webstories. Bookmark the permalink. My stomach seriously hurts from laughing so hard. You really went all the way with that one. I kept looking over parts of it and finding ones I missed. Well done! You and Stacy have set the bar very high early on, thank you! Nice work. ahahaahah this is great! love it!! This is really interesting. It reminds me of A Modest Proposal by Jonathan Swift. Ha, I didn’t even think of that when I was creating it, though now that you bring that up I can definitely see it.